Top performing companies are already boosting engagement with employees, customers and partners through a more consumer-like learning experience. We can help you boost engagement, too. We build learning, collaboration and performance tracking tools that look and feel like the consumer applications we rely on everyday. Consumer apps nail engagement. Whether they are presenting us with personalized daily news feeds, suggesting ways to improve our productivity, or reeling us in with addictive games, these consumer apps successfully engage us. Why should enterprise software be any different? We applied common attributes of all the great consumer software solutions that we love - things like a “must-have” user experience, a dedication to a single purpose for each tool, a modern approach to mobile, and the reliance on elegant, purposeful design - to the problems associated with internal and external learning. This has resulted in three distinct tools that all work together to help our clients continuously find new ways to engage their employees, customers and partners. "How Employee Engagement Drives Growth." Gallup. A modern approach to learning with Exceed LMS. Leverage all types of content, including formal and informal assets, with the Exceed Learning Management System. Experiment with a number of engagement tactics including personalization, recommendations, requirements, mobile, social collaboration and gamification, all from within the learning environment. Take a deeper dive into Exceed and our approach to learning delivery. Imagery, content organization, learning activity recommendations and even language settings are based on attributes associated with the individual learner, making the experience of logging into the learning environment highly personal. Learn more about our approach to “personalization”. Most learners have experienced bloated, clunky enterprise learning solutions that are not exciting or inspiring. Exceed leverages a modern, consumer software-like design that instantly feels familiar and drives learner engagement. Learners have a choice between a directed and discoverable learning experience. My List allows users to quickly view due dates, recommendations, content they’ve been enrolled in and historical completions. The catalog home page encourages learners to search for and explore content by keyword or category inclusion. Either way, learners are empowered to identify and consume the content they need when they need it. Learning professionals can rapidly create and deploy time-sensitive, stand alone content or mix and match informal and formal assets into broader paths for more comprehensive, engaging learning experiences. Learn more about the Open Asset approach. Learners can choose to access your learning environment, in it’s entirety, from their mobile browser or the new, standalone native iOS or Android mobile learning applications. With native apps come mobile notification reminders, a powerful way to stay in front of your learners. Learn more about the new native apps. Learners look for opportunities to communicate and collaborate socially. Rating, commenting on, and replying to comments at both the activity and path level gives the learner the sense that they are surfacing content and helping to improve the learning environment. Learners also respond when offered the ability to demonstrate what they are consuming and what they have accomplished within the learning environment. Earning badges or microdegrees and sharing them on social media gives learners a reason to continue to come back into the solution. Offer your audience a better way to communicate and share knowledge while reinforcing the learning strategies and initiatives tied to your larger corporate goals. 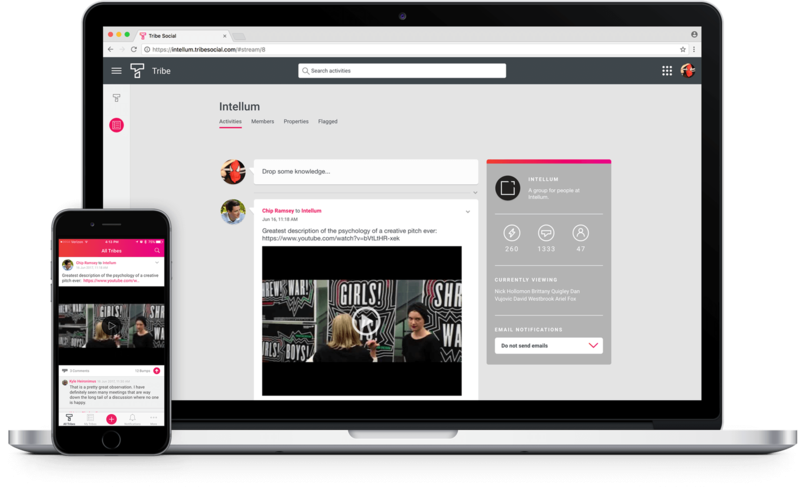 Each Tribe is a secure, invitation-only, private activity stream, where learners can share ideas, files, links, photos and video without the distractions associated with other enterprise collaboration tools. Control what information and which conversations individual learners and groups of learners can access. View user activity like frequency of visits or identify content specifics like most popular hashtag. Keep track of what your organization is talking about and turn those insights into action. Create unlimited Tribes within your organization, encouraging meaningful conversations between members of a specific team or with larger groups of learners. Conversations don’t stop just because a Tribe member steps away from her computer. Powerful native iOS and Android apps allow learners to stay connected to the conversation even when they’re away from their desks or out of the office. Mobile notifications draw learners back to Tribe, an important tactic in a larger engagement strategy. Members of specific Tribes can search activity streams, filter results and preview documents to find answers to questions, identify which version of a document to download or catch up on important internal communication. Gamified performance tracking with Level. Develop successful habits through gamification by assigning value to activities and actions in Exceed and Tribe. Pull in metrics from third party tools like your CRM to give your audience more insight into how learning impacts performance. Learners earn “XP” points for a wide variety of activity on the platform including completions, posts, comments and replies as they strive to move up to the next level. As learners earn points, they also earn badges for pre-defined engagements, like completing their profile, making their first post, or reaching certain milestones, like 50 activity completions. The metrics tab allows the learner to view her activity and XP for the current month and compare XP and activity month over month. Learners are encouraged to compete with their peers via the leaderboard, where they are ranked, by XP, in real time. Learners can click on a peer to explore and compare that team member’s status to their own. Learners can easily toggle to Level in the desktop learning environment without leaving the Exceed tab in their browser, but the standalone native iOS or Android app offers an even more engaging way to play the performance improvement game. Achievements and award notifications keep learners coming back to your environment. The points system, badges and third party data integrations are completely customizable, allowing you to tie the gamified performance tracking experience into your own brand. 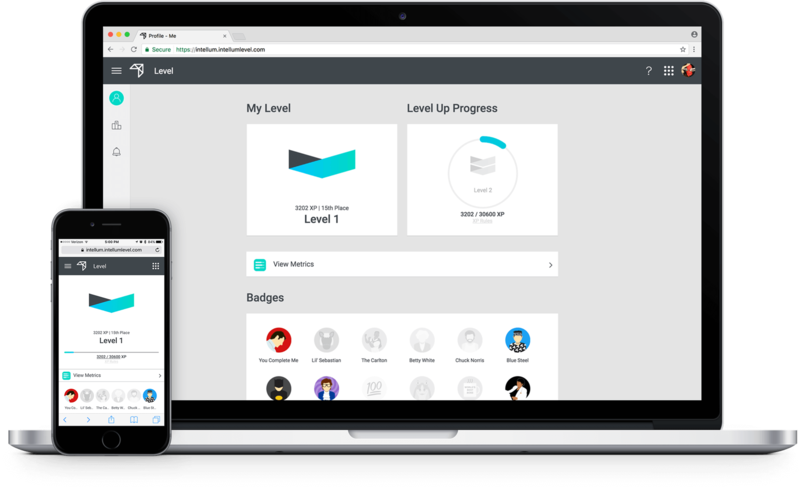 Level empowers both the learner and the learning professional to make very specific correlations between learning content delivered through Exceed, reinforced "socially" through Tribe and measured via Level.